Base of Operations: Mobile throughout the United States. Traveled from Queens, New York, to Texas, to the Midwestern United States, back to off the Eastern Coast of the United States. History: (Avengers I#286) - The Super-Adaptoid, after having copied the Fixer's technological skill, found and reprogrammed the Mad Thinker's Awesome Android to serve it. However, before anything could come out of this alliance, the Avengers showed up and took down the Awesome Android, and the Adaptoid escaped. (Avengers I#287) - The Super-Adaptoid went looking for Machine Man in order to recruit him to the Adaptoid's own cause. He found Machine Man and promised to return the Machine Man's lost love, Jocasta, if Machine Man agreed to join him. (Avengers I#288) - The Machine Man agreed and joined the Super-Adaptoid, but had suspicions of the benevolence of the Adaptoid's motives. However, for the time being, Machine Man followed the Adaptoid's lead. The two of them flew to Texas where they found the inert form of Kree Sentry #459 being shown as a tourist attraction. The Super-Adaptoid repaired and reprogrammed the Kree Sentry to serve him, and the three robots continued on their quest to gather the Adaptoid's army. Next, they went to recruit Tess-One, but the Avengers, suspecting that the Adaptoid might be interested in Tess-One, had sent the Black Knight and Dr. Druid to take Tess-One for safe keeping. The three robots intercepted the two Avengers, and while Machine Man and Kree Sentry #459 knocked out the Black Knight, the Super-Adaptoid copied Dr. Druid's mental powers, adding them to the powers of Mentallo, which he had stolen earlier, and knocked out Dr. Druid with a bolt of mental force. Super-Adaptoid then reprogrammed Tess-One to serve him as well, and the four of them flew to the Avenger's base of operations, Hydrobase. The Super-Adaptoid claimed it in the name of Heavy Metal. (Avengers I#289) - The powerful robots attacked Avengers Headquarters and began to tear it to the ground, while the Super-Adaptoid found the inert form of the Awesome Android, reawakened it, and took control of it once more. The Awesome Android immediately went to assist the other members of Heavy Metal in destroying the Avengers' headquarters. The robots were met with opposition from She-Hulk, Namor, and Marrina, but the Avengers gained little ground against the powerful robots. Meanwhile, just as Machine Man realized that this destruction was wrong and vowed to help end it, Stingray spied what was happening and went to assist the Avengers. But even with their help, the Avengers found themselves out-powered by Heavy Metal. However, the three Avengers managed to prevail, as Namor took the Awesome Android into the ocean and managed to pull off its head, and Tess One was pushed off the tip of Hydrobase and sank to the bottom of the ocean. The Adaptoid, meanwhile, had already infiltrated the Avenger's base, and intended to use their technology to summon Kubik, a being with the power of a Cosmic Cube, so that he might copy Kubik's power and become a god-like entity. The Adaptoid was opposed by Captain Marvel, but he disabled her with his mental powers. He then defeated Stingray and Machine Man and successfully summoned Kubik, whose powers he copied. The Adaptoid had gained nearly unlimited power unto that of a cosmic cube. (Avengers I#290) - Super Adaptoid imprisoned all the present Avengers in solid blocks of force, and then began to create countless other Adaptoids, planning to have each one replicate a human being and replace them, so the world would be populated by robots under the Super-Adaptoid's control. However, Captain America showed up and tried to play mind games with the Super-Adaptoid. The Super-Adaptoid took offense to that and sent one of its Adaptoids against Captain America. Captain America defeated the Adaptoid and then challenged the Super-Adaptoid himself. The Super-Adaptoid was feeling pretty insecure due to the suggestions of Dr. Druid that its ploy was ultimately pointless, and the The Super-Adaptoid replicated Captain America's powers and fought Captain America, but was unable to replicate his fighting spirit and was defeated. Super-Adaptoid's first attempt to recruit a robot to Heavy Metal was in Avengers I#286 (December, 1987), but it was unsuccessful. Super-Adaptoid began searching out other members of Heavy Metal in Avengers I#287 (January, 1988), starting with the Machine Man. However, he did not successfully recruit anyone until Avengers I#288 (February, 1988), in which their membership grew to three. 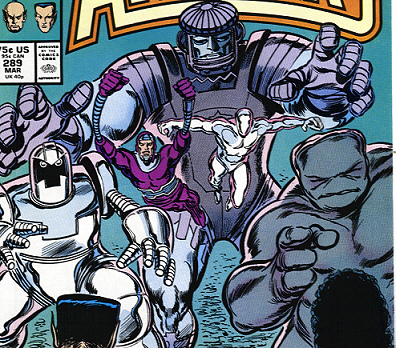 Their membership became complete in Avengers I#289 (March, 1988). But because the group started (albeit with only two members) in Avengers I#288, I'm counting that as their first appearance. The Doomsday Man was seen as a potential member of Heavy Metal, but was not revived to join them. In Captain America I#352, the Fourth Sleeper/Machinesmith infiltrated the Avengers Hydro-Base. During the melee, if memory serves (I don't have the issue with me), most of the members of Heavy Metal were revived and escaped. Can anyone confirm this? In Avengers Spotlight#27/2 (I think - it's the second Acts of Vengeance issue of Spotlight), the female Avengers Reservists battled several reactivated Heavy Metal members. Machine Man had a change of heart, Tess-One sunk to the bottom of the ocean, Awesome Android was defeated by Namor, and Adaptoid met his ultimate fate at the hands of Captain America. However, no explanation was given for the disappearance of Sentry #459. It was dragged underwater by Marrina, but that wouldn't do squat to it, and it was just promptly forgotten about a few pages later when Marrina helped push Tess-One off the base. If I refer to any of the robots by gender in this profile, it is just to make it easier for me to write and for the reader to understand.